Villa Ali Agung is located in the south west of Bali high up in the hills above Pecatu overlooking the Bukit area. The property enjoys panoramic 270 degree views across to Kuta, Canggu and the peaks of central Bali including the spectacular Gunung Agung. 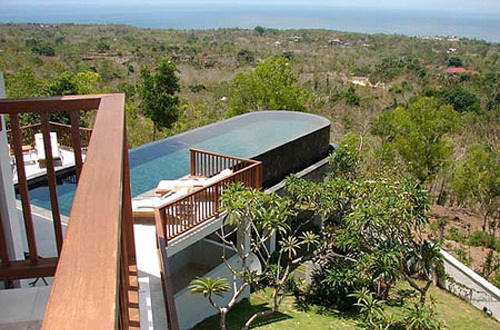 This villa is for those who appreciate complete privacy with breathtaking views of the south of Bali. This four bedroom villa was designed by the acclaimed architect Popo Danes and incorporates a unique layout that ensures all rooms have spectacular views. At Villa Ali Agung residents can enjoy sunrises and sunsets. There is an extravagant infinity swimming pool that sits high above the canopy of tropical vegetation below. Within the property there are beautiful manicured tropical gardens and lily ponds. The staff at Villa Ali Agung have all been trained to luxury hotel standards and are able to provide a tailored service to meet the residents needs. English is spoken by the most senior member of staff.